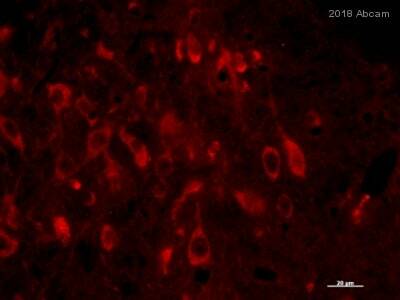 Rabbit polyclonal Tyrosine Hydroxylase antibody. Validated in WB, IP, IHC, ICC, ICC/IF and tested in Mouse, Rat, Goat, Cat, Human, Pig. Cited in 98 publication(s). Full length SDS denatured protein (purified from pheochromocytoma) (Rat). IHC-P: Mouse and rat brain tissue. 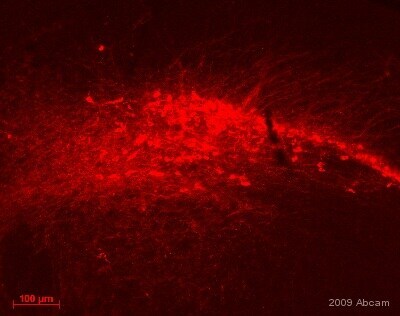 Rat dopaminergic neuronal tissue. ICC/IF: Human neurons. WB: Rat brain normal tissue lysate - total protein (ab29475), Mouse cell lysate (CATH.a neuron). PC-12 whole cell lysate. Rat caudate lysate. IHC-Fr: Mouse brain tissue. 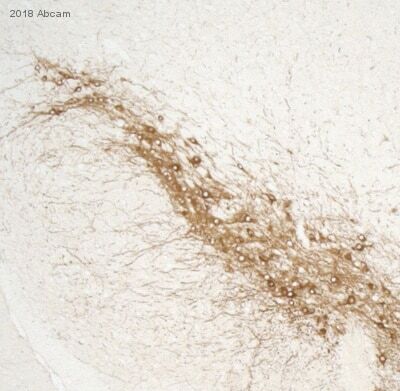 ab112 can be used as a marker for dopaminergic and noradrenergic neurons. Our Abpromise guarantee covers the use of ab112 in the following tested applications. WB 1/200. Predicted molecular weight: 60 kDa. Mainly expressed in the brain and adrenal glands. Catecholamine biosynthesis; dopamine biosynthesis; dopamine from L-tyrosine: step 1/2. Defects in TH are the cause of dystonia DOPA-responsive autosomal recessive (ARDRD) [MIM:605407]; also known as autosomal recessive Segawa syndrome. ARDRD is a form of DOPA-responsive dystonia presenting in infancy or early childhood. Dystonia is defined by the presence of sustained involuntary muscle contractions, often leading to abnormal postures. Some cases of ARDRD present with parkinsonian symptoms in infancy. Unlike all other forms of dystonia, it is an eminently treatable condition, due to a favorable response to L-DOPA. Note=May play a role in the pathogenesis of Parkinson disease (PD). A genome-wide copy number variation analysis has identified a 34 kilobase deletion over the TH gene in a PD patient but not in any controls. Immunohistochemistry (Formalin/PFA-fixed paraffin-embedded sections) - Anti-Tyrosine Hydroxylase antibody (ab112)Paul et al PLoS One. 2017 Feb 7;12(2):e0171285. doi: 10.1371/journal.pone.0171285. eCollection 2017. Fig 5. Effects of hypercholesterolemia on tyrosine hydroxylase (TH)-immunoreactivity in striatum (NCP) and TH-positive nigral (SN) neurons in MPTP-treated mice. Representative NCP (A-D) and SN (E-H) photographs from CS, HCD, MPTP and HCD+MPTP (left to right) groups showing TH-immunoreactivity. Mice were anesthetized with chloral hydrate (350 mg/kg; i.p.) and perfused intracardially with phosphate buffered saline (PBS, 0.1 M; pH 7.4) followed by 4% w/v PFA in PBS. Brains were removed and kept overnight in the same fixative, transferred to 30% w/v sucrose solution. 20 μm thick coronal sections passing through the NCP and SN were taken using Cryotome in poly-L-lysine coated slides. The sections were rinsed three times with 0.1 M Tris-buffered saline (TBS, 0.1 M; pH 7.4), incubated in 3% H2O2 in TBS, permeabilized with 0.3% Triton X-100, and blocked with 10% donkey serum containing 0.3% Triton X-100. The sections were incubated overnight with primary antibody for TH ab112 (1:700) in TBS, containing 2% donkey serum at 4°C and then incubated with HRP-conjugated secondary antibody (1:1000) in TBS for 1 h at room temperature. Colour development was performed by incubating the sections in DAB-liquid substrate system and then sections were washed, dehydrated, cleared in xylene, mounted in DPX and photographed under bright field illumination using a digital SLR camera. Immunohistochemistry (Formalin/PFA-fixed paraffin-embedded sections) - Anti-Tyrosine Hydroxylase antibody (ab112)Davis et al PLoS One. 2018 Feb 21;13(2):e0191436. doi: 10.1371/journal.pone.0191436. eCollection 2018. Fig 6. Lateral localization of CB1-R-dense striosome-dendron bouquets and ventral tier SNpc enveloping CB1-R-immunoreactive axons through the substantia nigra (mouse). An example of a TH- and CB1-R-positive dendron in the rostral SN is shown in Panel C.
Coronal vibratome sections (40 μm) or glycerol cryoprotected frozen sliding microtome sections (30 μm) were taken at levels extending from the prefrontal cortex to the ventral mesencephalon, and every 3rd to 6th section, depending on the experiment, was stained and imaged. Sections were washed in PBS-T (0.2% Triton X-100), blocked for 4 hours with 5% BSA in PBST, and incubated in primary antibodies overnight to 48 hours in a cold room on an orbital shaker. ab112 staining Tyrosine Hydroxylase in mouse brain tissue sections by Immunohistochemistry (IHC-P - paraformaldehyde-fixed, paraffin-embedded sections). Tissue was fixed with formaldehyde and blocked with 1% BSA for 10 minutes at 21°C; antigen retrieval was by heat mediation in citric acid. Samples were incubated with primary antibody (1/800 in TBS/BSA/azide) for 2 hours at 21°C. A Biotin-conjugated goat anti-rabbit IgG polyclonal (1/250) was used as the secondary antibody. 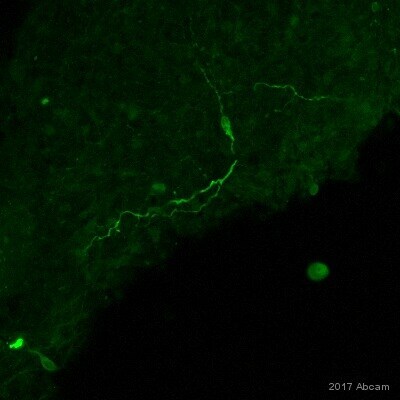 ab112 staining tyrosine hydroxulase in mouse brain tissue. Sections were permeabilized with 0.5% Triton X-100 in PBS at room temperature for 10 minutes. Samples were incubated with primary antibody (1:500) overnight at 4C. PFA-fixed, Triton X-100 permeabilized human neurons in cerebral organoid stained for Tyrosine Hydroxylase (green) using ab112 at 1/300 dilution in ICC/IF. ab112 at 1/500 staining rat brain tissue (ab29475) sections by IHC-P. The tissue was paraformaldehyde fixed and blocked with serum prior to incubation with the antibody for 14 hours. 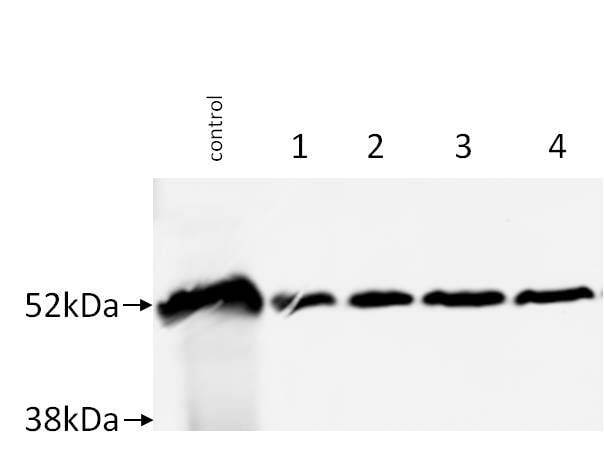 A biotinylated swine anti-rabbit IgG was used as the secondary. ab112 at 1/800 staining rat dopaminergic neuronal tissue sections (araldite resin sections) by immunohistochemistry. The tissue was paraformaldehyde fixed and then an antigen retrieval step was carried out (heat mediated). A biotinylated goat anti-rabbit IgG (ab6720) was used as the secondary. Paraffin embedded sections of rat brain tissue were stained for Tyrosine Hydroxylase with ab112 at 1/5000 dilution in immunohistochemical analysis (Panel 1). Panel 2 shows an image in which ab112 was replaced with a Rabbit IgG1 isotype control. Immunohistochemistry (Frozen sections) - Anti-Tyrosine Hydroxylase antibody (ab112)This image is courtesy of an Abreview submitted by Xiaobin Liu. ab112, at 1/750, staining tyrosine hydroxylase in mouse brain tissue (ab30151) by Immunohistochemistry (Frozen sections). Sections were PFA fixed, permeabilized in 0.3 Triton X-100 prior to blocking in 5% serum for 1 hour at 22°C and then incubated with ab112, for 16 hours at 22°C. Alexa fluor® 555 goat polyclonal to rabbit Ig (ab150078), diluted 1/1000, was used as the secondary antibody. Publishing research using ab112? Please let us know so that we can cite the reference in this datasheet.